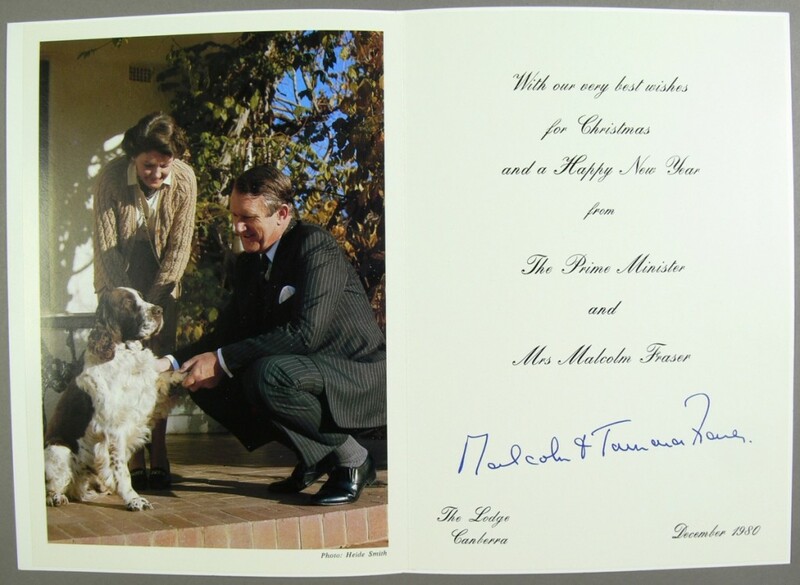 The Museum of Australian Democracy collection contains Christmas cards for almost every year of Malcolm Fraser’s prime ministership. 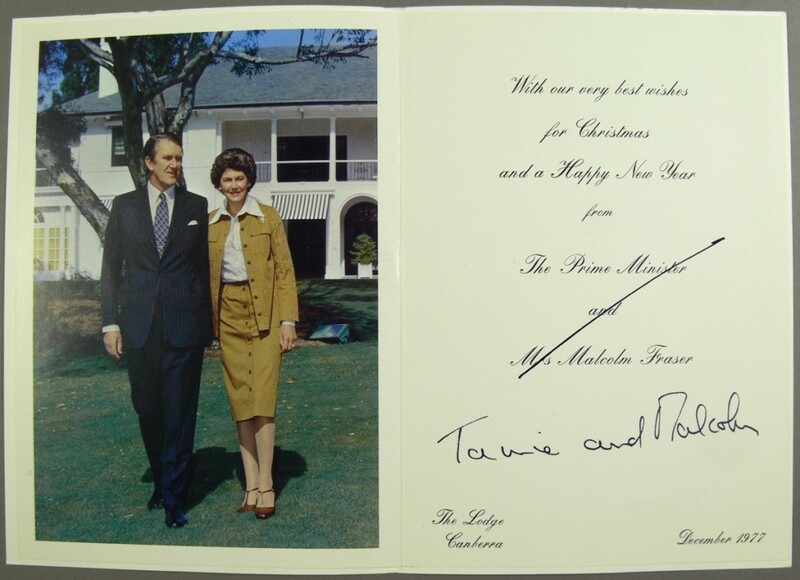 Spanning 1976 to 1982, the cards were donated by Caroline Cooper, a staff member in Malcolm Fraser’s office and later Private Secretary to Tamie Fraser. 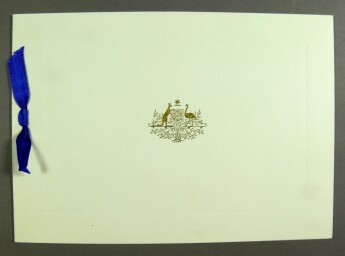 Prime ministerial Christmas cards were sent far and wide - to parliamentarians, staff, the press gallery, ambassadors, international leaders, corporations and organisations - and the process of devising and printing the cards, compiling the mailing list, signing and posting would have been a major undertaking. A festive gesture, they also had a political purpose by communicating a message about the prime minister and maintaining relationships. The Fraser Christmas cards provide a fascinating insight into the position, the man and his family and the places he called home. Superficially, the set of cards are rather repetitive. 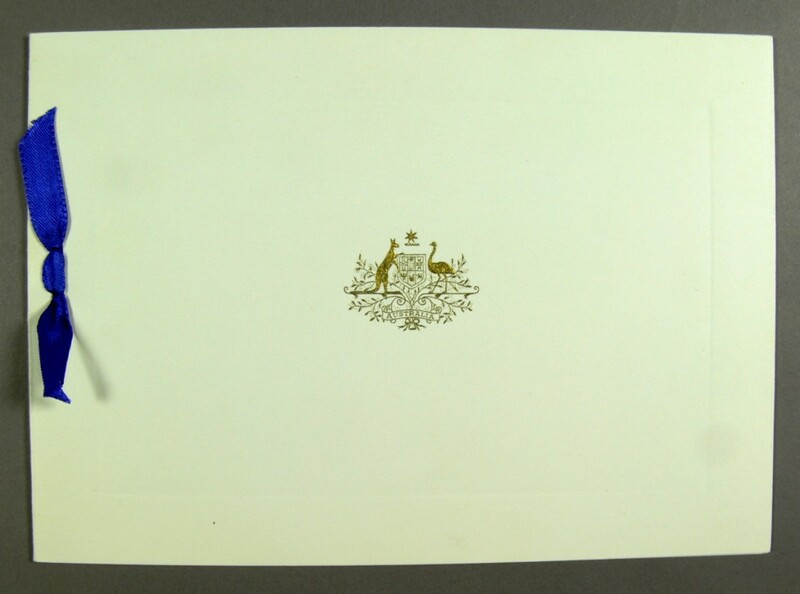 Every card is made with a heavy, soft and creamy white cardboard, the covers feature a gracious embossed Australian coat of arms and some sport a green or blue ribbon on the spine. 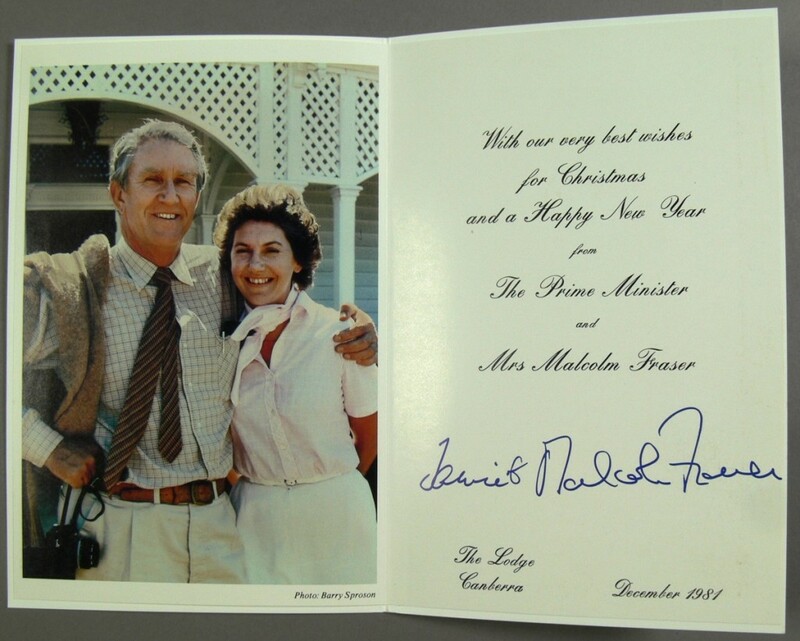 The folded inserts of glossy paper are inscribed in italicised script with an unchanging message ‘With our very best wishes for Christmas and a Happy New Year from The Prime Minister and Mrs Malcolm Fraser, The Lodge, Canberra’ followed by the month and year. In a confident and sprawling hand Malcolm has signed each card with a fountain pen. Variously ‘Malcolm & Tamara Fraser’, occasionally ‘Tamie & Malcolm Fraser’ and once the more casual ‘Tamie and Malcolm’. The interest in this set of Christmas cards is the accompanying colour photographs. Twelve months into their jobs of prime minister and spouse, Malcolm and Tamie lean on a gate at their beloved property Nareen in 1976. The following year the view moves back to the national capital with the couple on the lawns of the Lodge in Canberra. The four Fraser offspring flank their parents and stride purposefully down a grassy slope in 1978. Maybe the message is Malcolm Fraser, prime minister and family man. In 1979 Malcolm is at the office posed with Tamie in front of Parliament House – almost the classic tourist snap. Contrast with 1980 as a be-suited Malcolm incongruously shakes hands, or should that be paws, with an English Springer Spaniel while Tamie smiles on. Back at Nareen in 1981 the couple are arm in arm, Malcolm, a keen photographer, with camera in hand. The last Christmas card of his prime ministership introduces royalty with the Queen planting a tree at the Lodge watched by Malcolm, Tamie and a clearly delighted but disappointingly unnamed Head Gardener. While examining these cards I pondered what was going through the mind of the public servant who ordered them. Did they contemplate daringly changing the inscription or the font or the card stock or did tradition strictly dictate the style? 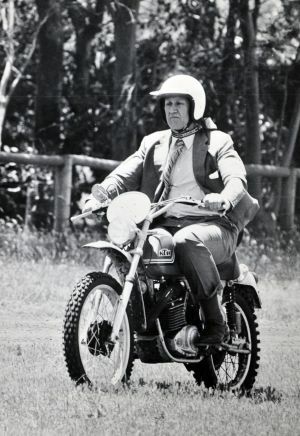 Did Fraser’s staff occasionally yearn to use the image of Malcolm and Tamie both helmet-less riding around the Nareen property on a KTM 500cc motorbike or mischievously slip in the humorous one of Malcolm in suit and helmet on the same bike? So, while you are devising your DIY Christmas card or browsing the range in the shops or composing your e-card consider what your set of Christmas cards might say about you in the future. The covers of the Christmas cards are remarkably consistent. Museum of Australian Democracy Collection. Kate Armstrong works in content development, interpretation and collection management at the Museum of Australian Democracy.